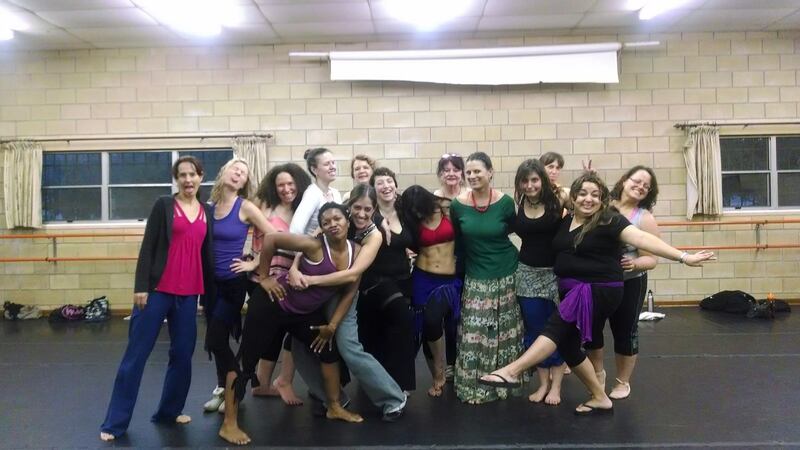 Beginning this Tuesday, May 6, Bellydance classes move to our home studio location in SW Gainesville. Please call or Email for directions. **Coming up: Slinky & Sassy Tribal Fusion Choreography … Stay Tuned and/or Email us for info. Hi everyone! Heather here, to tell you about some workshops I recently attended. This past weekend two local dancers, Leela of New York and Najmah Nour, co-sponsored a weekend with 2 workshops overviewing several Turkish folks dances (mostly line dances), as well as 2 workshops exploring the Turkish Oriental style through choreographies. Each day had one workshop focused on folk dances and one focused on an oriental choreography. This was nice to keep the brain from being overwhelmed with two much information on one subject. I loved both classes! The first day’s oriental choreography was also a blast. Some of the moves were pretty tricky, but I really *loved* the music. I really enjoyed this intensive, Turkish culture and dance are major influences on American belly dance, and so I think it’s an important part of the picture that we should have a bit of familiarity with. While the video itself is pretty compelling, I was more impressed with the author’s (Karen’s) words in the entry right below the video. I think the big thing to remember, for dance students in particular, is that every brilliant dancer you see was once a beginner at their craft, struggling to learn as they chased their own dream, but probably enjoying it. Many of those same brilliant dancers are even now still students – still struggling to learn more and more challenging things, digging deeper, and still enjoying it. Though her genre isn’t belly dance, I believe that there are some common aspects of all dance study to which her comments apply. I agree that dedication and practice really make a big difference. I believe that you do get out what you put in, and a lot of work goes into those few minutes on the stage. It is undoubtedly incredible what a person can accomplish if they push themselves past the first hurdle (getting started) and then work hard at it. I’m a bit torn on the idea of not needing to train for years to become a dancer. I think Karen is absolutely correct on the topic of being a dancer – and from the video, she’s an excellent dancer. However to become a full time professional dancer or a dance teacher, it is often necessary to train for a long time, simply due to the amount of knowledge and experience that must be acquired. One can speed up this process by focusing their efforts and putting a lot more hours into fewer years, but your mileage may vary. But, you needn’t stress about the process, and whether or not you are doing this whole dance thing properly just because you practice more or less than someone else. After all, artistic pursuits, even as casual hobbies, are often about growth. The only person to compare yourself to is your past self. It’s the journey that counts for a lot of people, and if someone has the time to devote, they can definitely press the gas pedal to speed up – or they can take the scenic route and enjoy the view. There’s no need to rush, so it’s up to you. There’s a lot more on the web site as Karen tells us her story, and I’m very excited to read it. Wonderful work Karen – you’re an inspiration! Belly Dance History and Our Newest Project! In the past, though sadly not so much today, it was not uncommon to have a full belly dance show performed at a restaurant or nightclub. These shows generally followed a set progression that still influences how belly dance shows are laid out today. Today we’re going to talk briefly about that show structure, and about a new project we are about to start at the Shambling Shimmies School of Belly Dance. 1. Entrance, to greet the audience. 2. Slow, flowing music with veil (previously wrapped and tucked). 3. Fast or medium-speed song to keep the show moving. 4. Floorwork, sword/tray balancing, or standing taqsim (slow). 5. Fast or medium-speed song to bring the energy back up. In a 7 part show, each section is a full song. Currently, it’s less common for a dancer to be hired for such a long show, so she will often use a variation on the 7 part format, taking 3 or 5 of the parts, which still gives her the opportunity to present variety and an interesting progression, in the reduced amount of time more commonly available today. While it’s rare, especially in Gainesville, to see a professional belly dancer hired for solo shows in a restaurant or nightclub, this totally still happens in larger cities. Today, it’s more common to see belly dance performed at a hafla (hafla means party, and is commonly used in the US to describe a party or similar event where there will be belly dancing). At most haflas there will be multiple dancers, most likely with different skill levels and presenting different styles of belly dance. Haflas are huge fun because they provide a great opportunity for belly dancers to get together to support and enjoy each others’ dancing, and they also provide performance opportunities for students that are ready to begin getting practice performing for an audience. As an audience member, seeing belly dance performed in a club or restaurant show is different from seeing it at a hafla, and even more different from seeing it in a stage show. When planning a hafla’s performance lineup, the organizer will often take into consideration the style of belly dance each dancer plans to perform, props they plan to use, or the music they plan to use, in order to lay out a pleasing and interesting progression for the audience. When possible, the classic 7 part show may influence the ordering of the acts. Harkening back to this era in belly dance history, we’re about to start a new project at the studio. 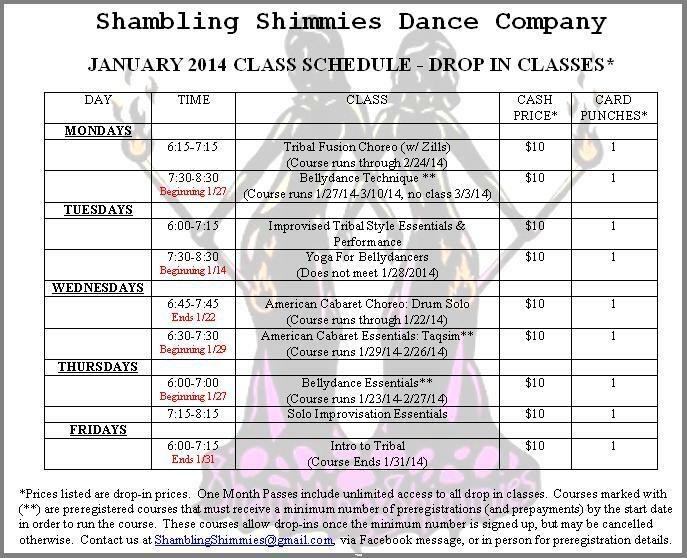 In our belly dance sampler class (currently on Mondays), we’re going to go through a 5 part show! We’ll also be going through much shorter and simpler ‘tastes’ of all 7 parts in the belly dance party jam class on Thursday nights! The belly dance stylization we’ll be using for this project is something that is perhaps best described as American Vintage – heavily inspired by Jamila Salimpour, the style includes a variety of movements from multiple middle eastern dance genres. We still call the stylization American because it came about in the United States when immigrants from many cultures came to the U.S. and people began to share their own music and dance with one another. Jamila Salimpour is a pioneer in the field that codified many movements and preserved a format that is still in use today. Though she’s very well known for her Bal Anat performances at Renaissance fairs, which used a tribal stylization and presentation (including a chorus or backline and featured dancers, still used today in both ATS and ITS), it may be less known that at the time, those same dancers changed costumes and performed the same movements to different music in shows at nightclubs and restaurants in the evenings.